ShopJRNation.com is proud to offer Dale Jr.’s most loyal supporters an extremely limited AUTOGRAPHED die cast. You will not be able to find this piece anywhere else. Since his first NASCAR® All-Star race in 2000 when he drove to victory in his rookie season, Dale Earnhardt Jr. has always known how to put on a show in one of the sport’s most exciting events. Now in the final All-Star race of his career, Earnhardt will battle the competition under the lights in a bright and brand new ride – the No. 88 AXALTA®/Maaco® Chevrolet SS . 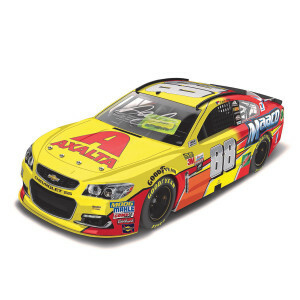 This paint scheme will be on track for one race only and is now available in die-cast form! The 1:24-scale Action Racing Collectables die-cast of Earnhardt’s All-Star race car is an accurate replica featuring over 180 parts and pieces and is also available in a 1:64 scale. This is a wonderfully made product and made a great new addition to my collection. If you're looking for quality this is it. Packaged well. Arrived in great condition.